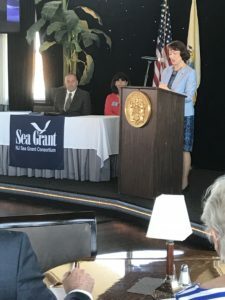 New Jersey Sea Grant Consortium hosted the 16th annual State of the Shore press event at Tim McLoone’s Supper Club in Asbury Park, NJ on Thursday, May 24th. 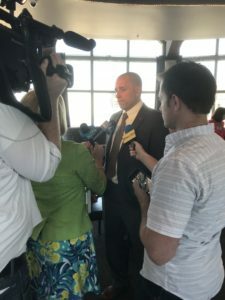 Along with the Consortium’s Executive Director Claire Antonucci, NJSGC’s Coastal Processes Specialist Dr. Jon K. Miller spoke to members of the media about current beach conditions at the Jersey Shore after a rather stormy and severe winter. NJDEP Acting Commissioner Catherine R. McCabe attended as the guest speaker and assured that the Garden State is fully prepared for yet another busy and successful summer season. For Dr. Miller’s full State of the Shore report, along with an introduction by NJSGC’s Communications Specialist Danica Bellini, please go here. Media coverage was widespread this year and included additional information on Rip Current Awareness thanks to NJSGC’s Coastal Ecosystems Extension Agent Dr. Amy Williams, who was also available for comment during the event. The New Jersey Sea Grant Consortium would like to extend a huge thanks to all those who attended and reported on the 2018 State of the Shore event, and we look forward to seeing everyone out on the beach this summer at the wonderful Jersey Shore!